It’s that time of year again. And sleigh bells aren’t the only jingles you’ll hear. Marketers will be ramped up with a bunch of new ads to delight and market to kids. 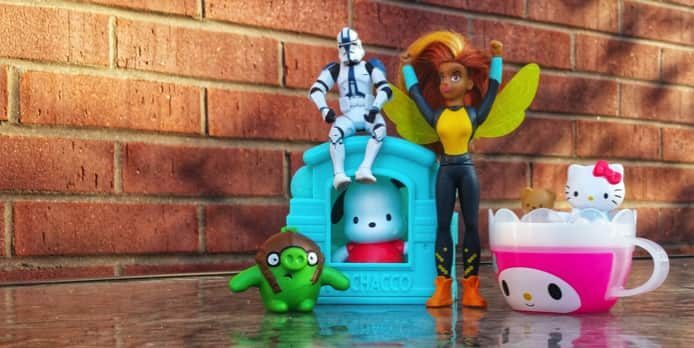 Billions of dollars are spent every year marketing to kids, although these days it’s hard to get a good estimate considering crossover advertising with toys, cartoons, fast food companies, movies, and the internet, all working together to move products. And if you haven’t noticed what’s going on in your youngster’s field of vision lately, you might be surprised. There are over 40,000 (and counting) Disney Princess items on the market. If you show almost any kid a picture of the Golden Arches, they’re likely to respond: “Do doo do doo doo, I’m loving it.” And ask if they can have a happy meal. And now it’s more than just TV bombarding our kids with ads. If they spend any time at all on the Internet, especially sites like YouTube, they’ll be marketed to as well. And just like with adults, strategic marketers will be pitching to your kids, based on their interests gleaned from the sites they visit. Watch an online episode of My Little Pony and voila! Here’s a banner ad for Rainbow Dash! Limit screen time. Easier said than done, but cutting down on the opportunity for exposure is the best way to shield kids from the marketing maelstrom. Have a blunt chat with the offspring about advertising. When they see a commercial for a kid-centric foot spa filled with plastic bubbles, talk to them about the likelihood of it actually transforming their room into a day spa for them and their friends. And how eventually that foot spa will become a bacteria-filled disco for germs. And it’s never too early to bring up the M-word…materialism. Pitch experiences over excess. Memories of that visit to the zip line park or ice skating rink will last a lifetime. That new toy will be yesterday’s news (and landfill) in a startlingly short period of time. Lead by example. If you ooh and ahh over the latest things touted in commercials and ads, those little sponges learn to do that, too.